Since the mass shooting at Marjory Stoneman Douglas High School in Parkland, Florida on February 14, 2018 during which Seventeen people were killed and seventeen others wounded, student Emma González has become a gun control activist and media icon. On Saturday March 24th Emma and other students participated in the “March For Our Lives” event in Washington D.C..
Ms. González admitted during her speech, that she participated in the bullying and ostracization of alleged shooter Nikolas Cruz. Not only did she admit to it, she justified it. “Since he was in middle school, it was no surprise to anyone who knew him, that he was the shooter. Those talking about how we should have not ostracized him? You didn’t know this kid! OK? We did!” Said Ms. González. 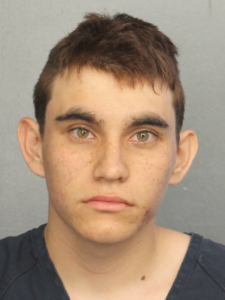 According González, Nikolas Cruz “deserved” to be ostracized. While the rest of the country may not know Cruz personally, and cannot judge what we might have done in her place, I think it is safe to say that it is never appropriate or moral to judge and dehumanize another human being. Marolo Alvarez another of Nikolas Cruz’s classmates told reporters during a memorial held at Parkridge Church that he remembers students taunting Nikolas Cruz. “He looked like a school shooter,” Alvarez said students used to say about him. “I could have said something to administrators, that ‘hey this kid gets bullied a lot, please help him, please reach out to him.’ I kind of regret not doing that,” Alvarez said. The National Education Association reports that one child is bullied every seven minutes, and in schools across America, one in three students reports being bullied weekly. David A. Levine is the author of “Teaching Empathy”, and developer of a series of workshops given to school children to teach empathy as a bully prevention strategy. While Ms. Gonzalez and the other students are within their rights to ostracize someone they see as a “bad actor” is this really the best way to respond to someone you see as a risk for violent behavior? There is a lot of discussion about “mental health” when it comes to school shootings, but a topic that doesn’t seem to have gotten much attention is emotional health. “People say mental health is the issue, and that’s true. My mental health was in sad shape. I was severely depressed and suicidal. I felt like I had nothing at all in life to look forward to, and so I literally had nothing to lose. When someone has nothing to lose, they can do anything, and that thought should be terrifying. So, yes, mental health was an issue. A bigger issue was love. I had a severe lack of love,” Stark says. At the end of the video Aaron challenges us to love those who need love even if they don’t deserve it. He understands that school shooters may not be monsters, but lost, lonely, hurting people who do not know how to deal with or heal their emotions. Ms. Gonzalez and the other students aren’t ultimately to blame. They aren’t taught empathy. In government schools especially, force is taught as the appropriate response to conflict or problematic behavior. Spanking teaches children from a very early age that physical force is the solution to conflict, or “might makes right.” Indeed it is the very concept our entire democratic system is built on. Consensus of the majority has the right to use force on the minority. With these concepts being so deeply ingrained in the psyche of our society, how could children in fact be expected to empathize? Even adults have recently adopted the philosophy that it is ok to bully and in fact harm other adults whose ideas they disagree with as evidenced by the “punch a Nazi” meme that has been circulating in response to the rise of the alt-right sub culture. 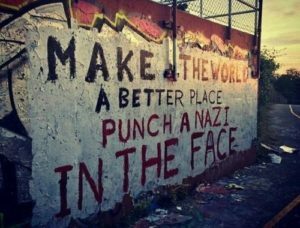 Does punching Nazis make the world better? What if instead of punching Nazis, or ostracizing weird, mean, or ugly kids we make the choice to empathize with the pain and isolation they feel that causes them to act out in anti-social and violent ways? What if we started “hugging Nazis” instead? Musician Daryl Davis has been doing exactly that for decades. Daryl is the son of a U.S. Diplomat and learned from an early age that communication is the best way to improve relationships. Daryl says he is just applying techniques his father used with foreign governments to racists in his own country. 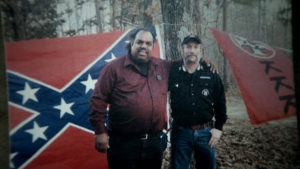 Musician Daryl Davis befriends racists and uses empathy to stop the hate. “It’s when the talking ceases that the ground becomes fertile for violence, so always keep the conversation going.” Said Davis during an interview about the documentary “Accidental Courtesy” (Now available on Netflix) which tells the story of how he used empathy to convince over 150 Ku Klux Klan members to turn in their hoods. In the 1960’s Marshall B. Rosenberg, PhD developed a communication technique called “non-violent communication” or NVC for short. NVC employs active listening, refrain from judgement and empathy for pain. Using these techniques trains people to use compassion to foster emotional connections which meet the needs of those we communicate with. If we actively listen without judgement to hurting people like Nikolas Cruz, Aaron Stark or Christopher “the crying Nazi” Cantwell, we can identify their need to be heard, validated and ultimately to be loved. If we meet those needs by empathizing with their loneliness (we have all felt the sting of rejection and loneliness) the connection we form can heal those hurts and with enough love and acceptance avoid violent manifestations of those negative emotions. It is still possible that Cruz could have been shown all the love in the world and still acted out in violence. 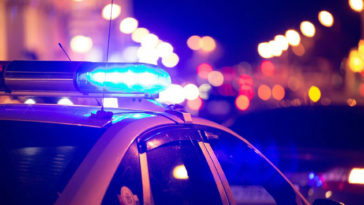 Many children don’t resort to violence on the scale of a school shooting, but may hurt their siblings, animals or themselves. One thing is for sure, the use of non-violent communication is a better choice for conflict resolution than bullying or ostracization. It seems to be the most efficient way to diffuse conflict in a way where all parties feel validated, giving them the best chance to heal their negative emotions.